It is important to monitor the patent transaction landscape, and identify companies actively acquiring or divesting particular patents. 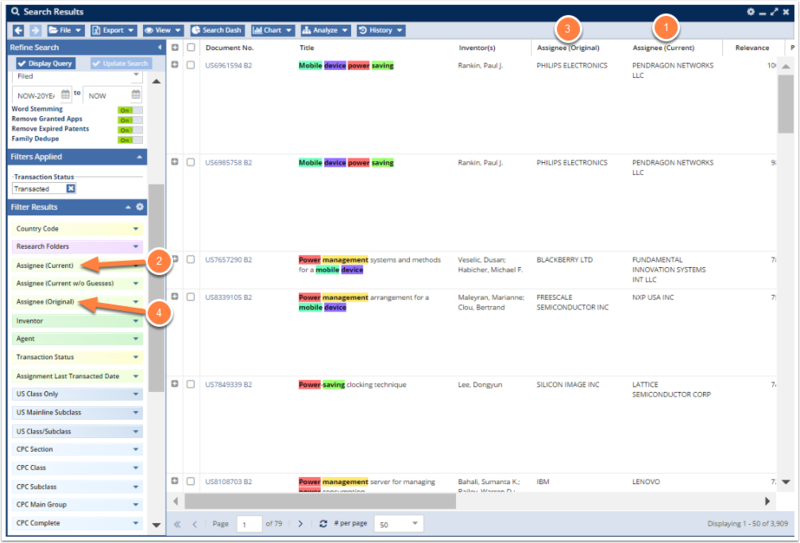 AcclaimIP includes a filter that identifies patents that have transactions. If the current and the original assignee do NOT match, AcclaimIP marks the patent as Transacted. That is, they are different, and therefore it is likely that a transaction occurred. Once you have found a set of patents you can begin looking for transactions inside those results. In the example above, I searched for patents related to "power management" or "power saving" on a mobile device. The options in the Transaction Status filter (1) are Not Transacted or Transacted. "Not Transacted" means that the normalized versions of both the current and original assignees are the same. That is, there is no detectable change of ownership. 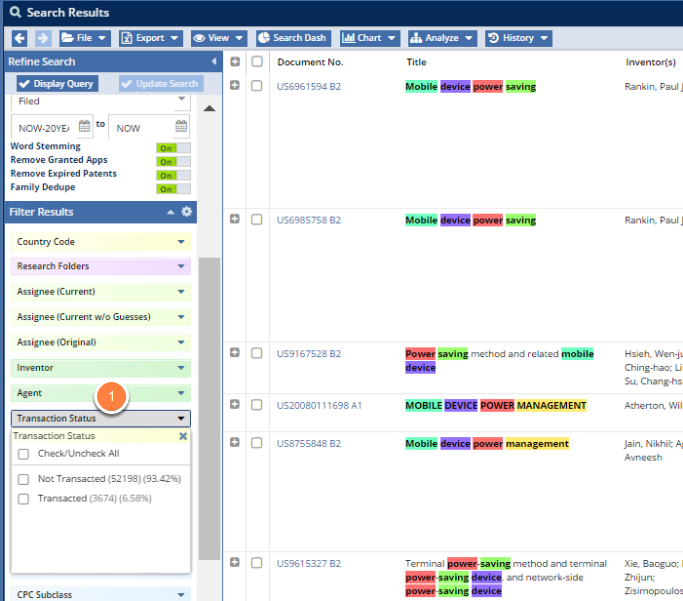 By contrast, the "Transacted" facet shows patents where the normalized versions of the current and original assignees do NOT match. If I restrict my previous search by clicking on Transacted in the Transaction Status filter, and then click the now active Update Search button on the Refine Search panel, I get the results above. Notice that the results here are a list of patents where the current and original assignee names do not match. 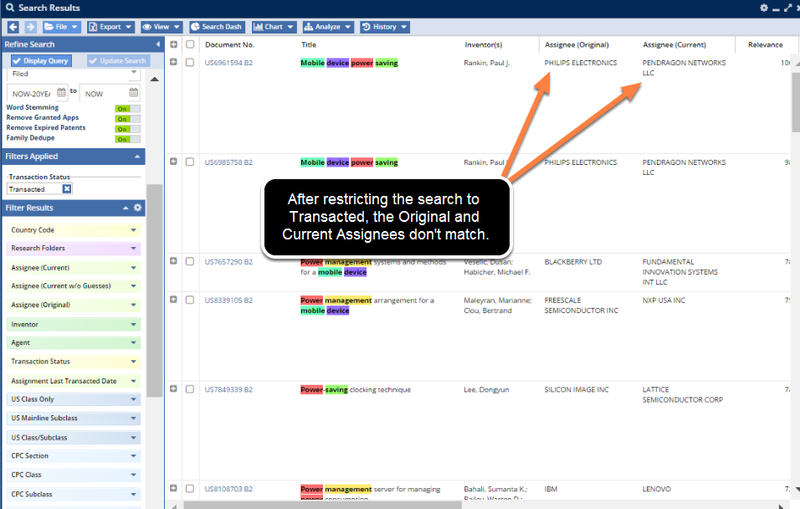 The buyers are listed in the Assignees (Current) column (1) of the search grid. These are the current owners of the patents. If you want to find out who has purchased the most patents, check the Assignee (Current) filter (2) in the Filter Results panel and view the facets of the top purchasers of the patents you defined in the first step. The sellers, then, are listed in the Assignee (Original) column (3) and are those companies or inventors who originally filed or owned the patent. You can find out who has sold or assigned the most patents by checking the Assignee (Original) filter (4) in the Filter Results panel, and view the facets listed there. Let's say you are not interested in transactions that occurred 15 or 20 years ago. Instead, let's say you want to refine your set of bought and sold patents to more recent transaction dates. 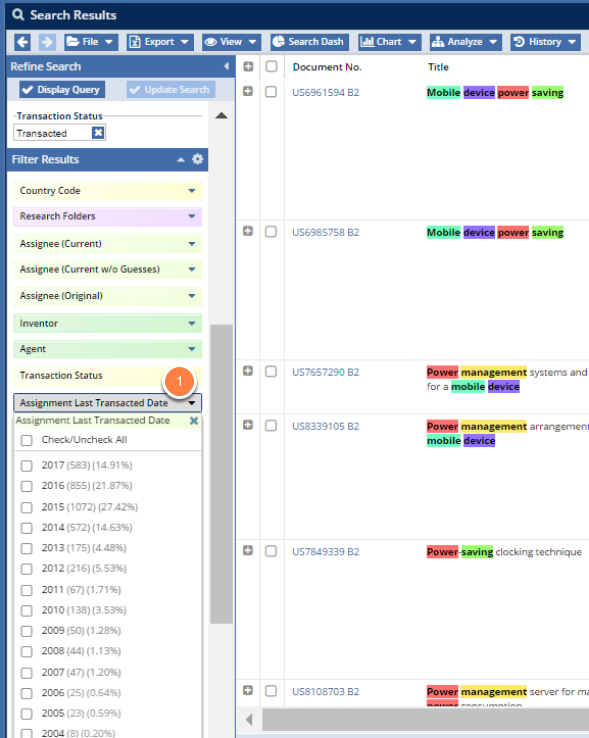 Use the Assignment Last Transacted Date filter (1), check the years that you want, then click the now active Update Search button to get your results.